On our first day of coverage we saw quite a respectable performance out of GOHE, with a solid move on the chart, along with an influx of heavy volume. The stock traded in a range from .025 to .035 on the day, which worked out to an intraday move of 40%, with more than four times the 30-day average number of shares changing hands. We’ll continue to keep a close eye on the stock, looking for the recording of higher lows and higher highs in sessions ahead. For another quick recap of a recent mention of ours to make significant strides during yesterday’s session, we’ve got AMLH. We included a tag of this play in Tuesday’s report, and saw a moderate pop toward the end of that session, but yesterday is when things kicked into a higher gear in terms of intraday movement. We watched as AMLH traded up from a low of .0027 and eventually hit .0052, for a daily rip of 93% which occurred on roughly 2.5X the monthly average volume. We always like a good earnings-related options play, so we’re looking at KMX this morning, which recently showed signs of reversing off of a relative bottom.
. After a solid beat, we’ve seen a moderate premarket gap-up, and would like to signal a range of longer-term ideas that could see some appreciable gains if KMX can mount an extended comeback. We’re going to focus on the KMX 05/19 $60-$65 Calls. For a shorter-term idea, we’ll watch the KMX 04/21 $57.50 and $60 Calls. 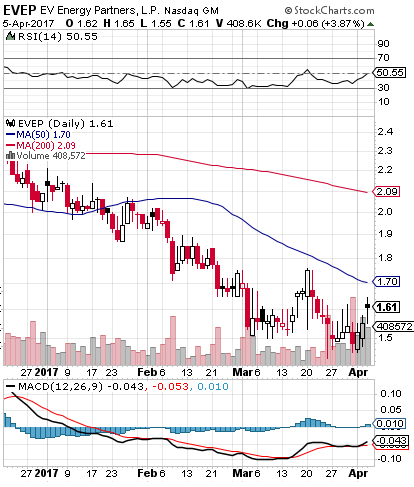 We like the look of the chart on EVEP, which we’re going to tag as a potential bottom-bouncer this morning. The stock has already strung together a few bullish sessions, and the chart itself looks ripe for the possibility of a more protracted recovery. As you can see on the snapshot below, the RSI is on the cusp of cracking the 50-line, while the MACD just underwent a recent bullish cross and is showing upward divergence. These technical indicators put EVEP high on our list of possible recovery plays.